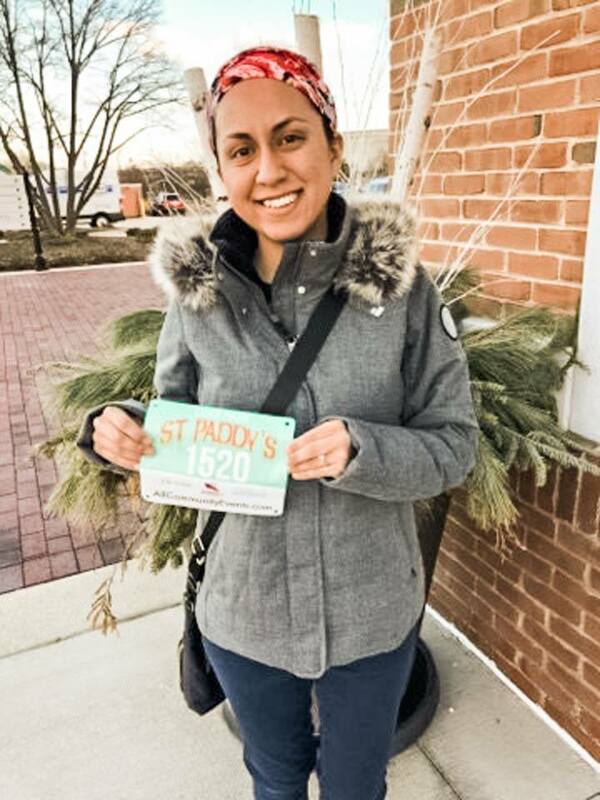 For my birthday month, I registered for a 5K and I PR’d! In this blog post, I share a race recap, my 5K time, and plans for the future. Deer Park St.Paddy’s 5K took place at a shopping center, Deer Park Town Center in Deer Park, IL. There was also a 10K route, but I did the 5K. I’m so glad I only did the 5K because it was very cold! It was below 30 degrees with winds. I went to packet pickup the day before. A very thin long sleeve sweatshirt was included with registration. Usually All Community Events races give out red reusable totes at packet pick up, but this time they gave out red plastic bags. On this day, Friday before the race, my daughter did not feel great and was sick with a fever. It lasted about a day and half, and she was unable to run the kid race. I love seeing my daughter run and enjoy this sport, but there’s always a next time. The week of the race was my birthday week and I had been eating cake, cookies, and all kinds of pastries the days leading up the race. I don’t recommend doing that, but I’m glad it didn’t affect my running the day of the race. Read about my birthday HERE. The morning of the race, I ate a bowl of oatmeal and a banana. I drank water and headed to the start line. I was early for once. I usually run to the start line and immediately start the race because I’m not a morning person. There was live Irish music entertainment. I tried to stay in the a sunny area to help with the cold before race time. I ran as much as I could with taking a couple few seconds walks in between. My training runs include a lot of walking, but when I race I try to walk very little. My Fitbit somehow did not start when I started it, and I didn’t realize it until after mile 1. I didn’t look at it the whole time since it didn’t start at the beginning and plus I figured it would be best for me to not look at my pace on my watch. I think that helped me PR! I finished the 5K with a time of 34:47 minutes! My goal for this 5K was to PR, but because it was on my birthday week and I had been eating a lot of cake, I was afraid I wasn’t going to PR. I’m so happy I did it and not looking at my Fitbit watch also helped! No medal 🙁 I got a St.Paddy’s 5K/10K drinking glass, a huge shamrock cookie, granola bar, bag of peanuts, and water at the finish line. I looked around and found a bunch of freebies after the race. Elena was happy with the art supplies I brought home. There was a preschool giving out flyers and art supplies with stickers and more. I highly recommend this race to any runner or walker. All of the races organized by All Community Events are always well organized and I keep signing up for more! I’m running Chi-Town Half Marathon in Chicago on April 6th! Currently, I’m running 4-5 days a week with my long runs on Sundays. This will be my 3rd half marathon and it will be a PR for sure. The last two I’ve ran had been in Disney (Disneyland & Disney World) and those I stop for many pictures with characters. This race will be different because there will be no characters. Congrats on the 5k PR! I love the PR feeling, you know you’re building fitness and faster than before! I’m getting closer to the Salt Lake City Half Marathon on April 13th, even though my last week of training wasn’t the greatest: https://runningmybestlife.com/half-marathon-training-diaries-week-8/. I think it’s important to share our experiences–good AND bad–to encourage each other to keep going even when everything isn’t necessarily going smoothly! Great post. I used to be checking constantly this blog and I am impressed! Extremely helpful information particularly the last phase 🙂 I deal with such information a lot. I was seeking this certain info for a very lengthy time. Thanks and best of luck.